Zack Snyder has just shared something very awesome from Justice League. It's a new video that shows Jason Momoa as Aquaman swimming underwater. Justice League is coming out this year and despite the fact that there is some trepidation about the DC Extended Universe as a whole at this point, it is a big deal and there is a ton of excitement surrounding the movie. Sadly, we're are still waiting to see an actual trailer. The closest thing we got was more or a less a teaser when Warner Bros. unveiled the footage at San Diego Comic-Con last year, but that was months ago and the DC fans are getting impatient. While it may not be a trailer, this footage from Justice League that recently surfaced online is pretty awesome. The footage made its way online following a visual effects screening that was recently held for Justice League. The movie itself wasn't screened, but Zack Snyder was reportedly showing off some of the visual effects footage that will be used in the movie. Specifically, we get to see Jason Momoa's Aquaman in action underwater for the first time. The clip, which luckily made its way onto Twitter may be brief, but it is really encouraging. In the video we can see Arthur Curry swimming gracefully up to a statue that is sporting what appears to be the armor we have seen Aquaman wearing in promotional images for Justice League. In this particular sequence, Arthur Curry is just wearing some black pants. 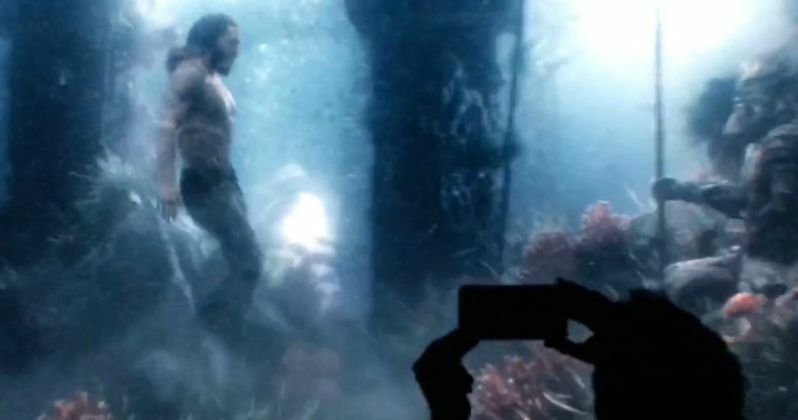 There is the scene from the Justice League footage released last year that shows Aquaman standing on a pier drinking a bottle of alcohol before the water overtakes him, which was one of the coolest shots from the SDCC footage. In that sequence, it looked like he was wearing similar pants, so that could be the precursor to what we are seeing here. Either way, this looks pretty fantastic. Especially for something that could come off as very silly. Outside of Justice League, the Aquaman solo movie is gearing up for production soon under the direction of James Wan. Considering that movie is going to have the same stunt team from Mad Max: Fury Road, a cast that includes Amber Heard, Patrick Wilson and Willem Dafoe in addition to a creative mind like James Wan, the movie already has a lot of potential. Seeing even this brief bit of footage piles on just a little more and gives us reason to think that Aquaman could ultimately be a movie we're all really looking forward to come October 5, 2018. The cast for Justice League includes Ben Affleck as Batman, Henry Cavill as Superman, Gal Gadot as Wonder Woman, Jason Momoa as Aquaman, Ezra Miller as The Flash, Ray Fisher as Cyborg, Amy Adams as Lois Lane, Willem Dafoe as Nuidis Vulko, Jesse Eisenberg as Lex Luthor, Jeremy Irons as Alfred Pennyworth, Diane Lane as Martha Kent, Connie Nielsen as Queen Hippolyta, and J.K. Simmons as Commissioner Gordon. Justice League is directed by Zack Snyder and is set for release on November 17. Be sure to check out the brand new Aquaman footage for yourself below. I made a little something.